I got the most relief from the side effects of Levaquin from the ice treatments followed by heat described here. I took Levaquin for 7 days for a persistent sinus infection. From the start I had SERIOUS INSOMNIA, but didn't connect the two right away. I was LIGHTHEADED and just felt awful. Then I began with PAIN IN MY KNEES AND HIPS. I attributed the pain to the violent, unusual wind storms in the area caused by the atmosheric pressure going crazy. By about day 5 I ACHED IN NUMEROUS MUSCLES, MOSTLY THE LARGE MUSCLES OF MY THIGHS, UPPER PART OF MY LOWER LEGS, BUMM, AND LOWER BACK. Being busy, I kept thinking I should read the drug literature that came with the prescription, but I didn't until after I had taken the final 7th dose. Of course then I could see that all of this was apparently from the Levaquin. By now I was STIFF AND ACHEY AND FELT LIKE AN OLD WOMAN. My JOINTS HURT not inside the joint like the pain my arthritis causes but around the edges of the joint. I also hurt not in the middle of a muscle as when one over exercises, but all AROUND THE EDGES of my buttocks and other large muscles. I could BARELY CLIMB THE STAIRS or get in a car because of the STIFFNESS. I am very active for my age (64) and I had continued to go to water aerobics and water zumba early in the course of Levaquin, but could not keep up as I usually do. By the end of the course of Levaquin I could barely pick up my feet. THE PAIN IN THE BACK OF MY RIGHT KNEE WAS BY FAR THE WORST, although both knees hurt more than any other area. I probably aggravated my knees with the water zumba early in the course of medication. The pain was different from my arthritis, being in the area AROUND my knees and mainly behind the knees. I did. But I still couldn't function. Finally I found these pages and reading them and using just one of the ice treatment followed by heat (a hot bath) then another ice treatment, and heat - the pain is almost gone, amazing. It has been 4 days since I finished my 7 days on Levaquin. I still am not back to normal but it is better than it was. I am making bone broth soup and have started magnesium supplements, as recommended here. Magnesium for Tendonitis applies in the situation in the sense that it's related. But Levaquin causes massive magnesium depletion. Everything you've described are Signs of Magnesium Deficiency..
Other negative things happen with Levaquin cytotoxicity, of course, but magnesium deficiency is a HUGE factor. Icing will help you feel better, but it doesn't fix anything. Rest and Anti-inflammatory drugs like Ibuprofen won't fix anything either. You have to get as much Magnesium into and onto you as you can. There's other things that would be smart to do, but if you were only going to do one thing, getting your body as much magnesium as it needs should be that one thing. more suggestions for dealing with Levaquin Tendonitis? I'd suggest getting a complete plan of attack. 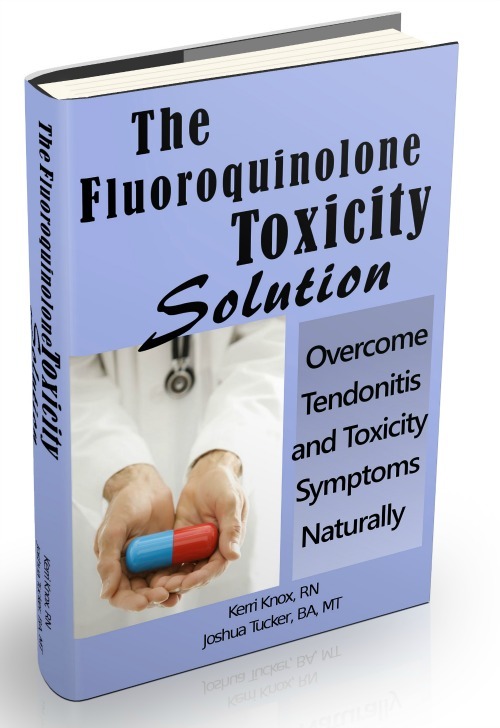 Specifically, The Levaquin Tendonitis Solution ebook. Tips are ok, what I said about Magnesium for instance. Or I could tell you to get your Vitamin D level up to between 50-80 ng/ml. Or I could tell you to go gluten free for at least two months, and eat more protein and good fats. But Levaquin poisoning is a BIG DEAL. It's NOT simple. It's important you understand why it does what it does, and the various factors involved. If I just give you a couple tips it's a big disservice to somebody with Levaquin Tendonitis. The ebook is the way to go. Don't get me wrong, what I said about Magnesium is a huge component. It -may- be all a person needs if done correctly. Every situation is different. Having said that, depending on how bad the levaquin reaction is and what it did to a body, it's increasingly unlikely that -just- magnesium is going to 'fix' your body. Sooo, the ebook is my main suggestion. Because it is the pathway of highest return. After taking Levaquin for 5 days was so sore I could hardly move. by the 7th day my rt knee hurt. Then knee became swollen and extremely painful. Turns out I had a complex tear in my meniscus. Had never had knee problems before....of course doctors say it couldn't have been the Levaquin or they just look at you! Yeah....doctors aren't particularly inclined to believe that a pharmaceutical they regularly could possibly injure anyone so severely. A lot of that symptomology is severe magnesium deficiency caused by the Levaquin. Get the ebook! Get on the program and start countering the side effects and the downsides asap! I was prescribed this drug to treat a UTI. After taking the first pill, my right knee was stiff, swollen and painful. I had had twinges in that knee on and off for the past 9 months so I really didn't associate my knee problem with the antibiotic until I was at the end of my 7 day Rx. The drug information mentioned tendinitis and usually in the ankle, shoulder or hand. The first few days when it was so painful, I was taking 800 mg ibuprofen and using a knee brace. I also used ice to help the swelling. It has been a month and I made an appointment with an orthopedic doctor for next week even though I am lots better. I am wondering if I have done permanent damage to my knee. I hope the doctor will give me good news. I will never take that medication again. HOpefully your symptoms are primarily from nutritional depletion. Damage or not, only time will tell (or an MRI). On my 6th day of taking Levofloxacin 750 mg I started getting pain in both my knees. The 7th day it was unbearable, I can't climb stairs, pick anything up, I can barely get my shoes on. I want to cry when I drive my car because the pain is so severe it hurts to press the peddles. One site I was reading a lady said she has been in pain for two years since she took the drug. I pray not. It's been three days since I took my last dose. I'm going to try loading up on magnesium, even though I was already taking extra of it before. I can't believe this is happening. This drug needs to be off the market.